St Valentine’s Day is almost around the corner, and if you are seeking new ideas for something delicious and absolutely unique, we offer this exotic Zebra Chocolate Cake recipe by C.J. Hartsock, that nobody will be able to resist! C.J. is a mother of four son’s ranging in age from 19 – 6. She lives in Corona CA and she works full time as an Educational interpreter – American Sign Language. C.J. has been passionate about cake decorating for almost 2 years now. Her first baking contest for the Corona Lemon Festival not only granted her best decorated cake, but also best in show. She also entered the San Diego Cake Competition and she won third place for its category with her “Angry Leprechaun”. This year she is entering three new designs for the San Diego contest. Good luck C.J, we know you can make it! Most people are more accustomed to eating the box cakes instead of the made-from-scratch variety, which is what I do. (INSIDER TIP – double the oil) The layers of black filling are actually chocolate ganache frosting, which is super simple: melted chocolate chips and heavy whipping cream. If you want the ratio’s I can give you that. In the picture I made a 2 layer cake, and torted the layers (cut in half). When the ganache is added, it goes between the one cake layer, between the two cakes, and then between the top cake layer. That is why the photo looks like it has 4 layers of cake and three layers of filling. I make my own Marshmallow fondant: a bag of melted marshmallows, 3T water, and powdered sugar in an electric mixer to make the marshmallows stiff. Let it ‘rest’ overnight and roll out on a powdered sugar surface. 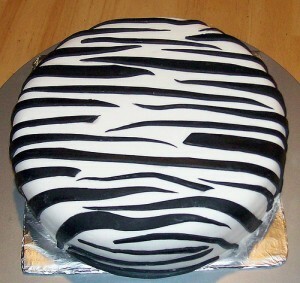 The zebra strips are made with chocolate molding, melted chocolate and Karo syrup. I roll out the chocolate, and cut it in random strips with a pizza cutter, wet the back with a food paint brush to make the fondant adhere to it. It is really easy, and the end results look really good. I don’t know if it is “really easy”, but it looks spectacular and it sounds really delicious! Thank you C.J. And here is “all the rich delights of chocolate, captured in one volume of decadence”. 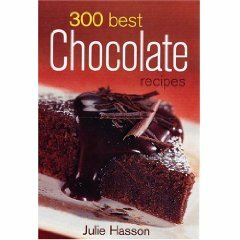 300 Best Chocolate Recipes is an outstanding collection of chocolate recipes originally published in two books, 125 Best Chocolate Chip Recipes and 125 Best Chocolate Recipes. This sounds delicious, I like the neon idea! 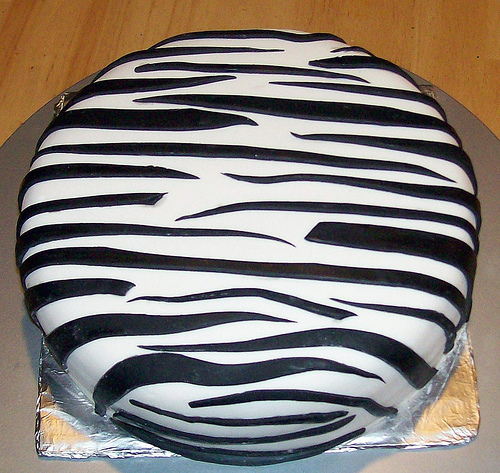 If you have more Animal Print dessert ideas, let us know. Thank you for visiting Animal Print Essentials!